Hey howdy hey everyone! 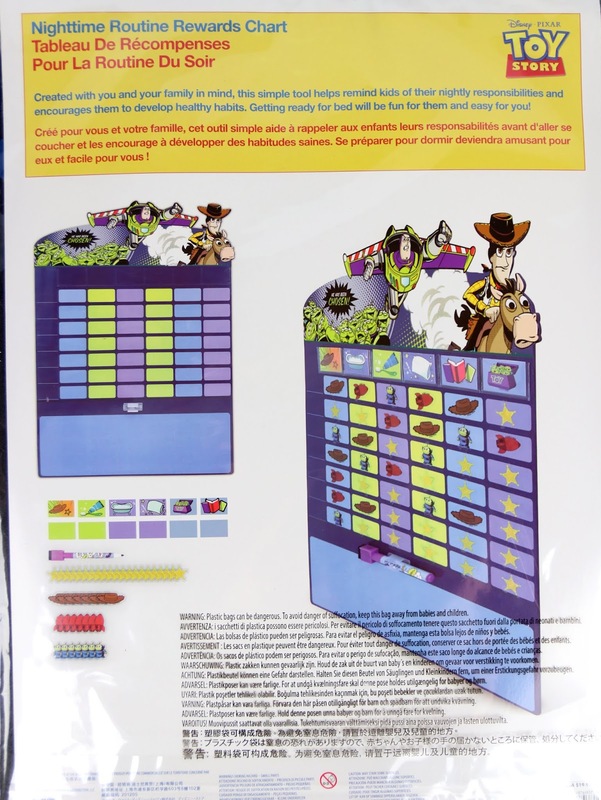 A few months back, the Disney Store/ShopDisney.com released this cute Toy Story inspired Nighttime Routine Reward Chart. While my wife and I don't have any kids quite yet, I had to grab this and put it away for the future. 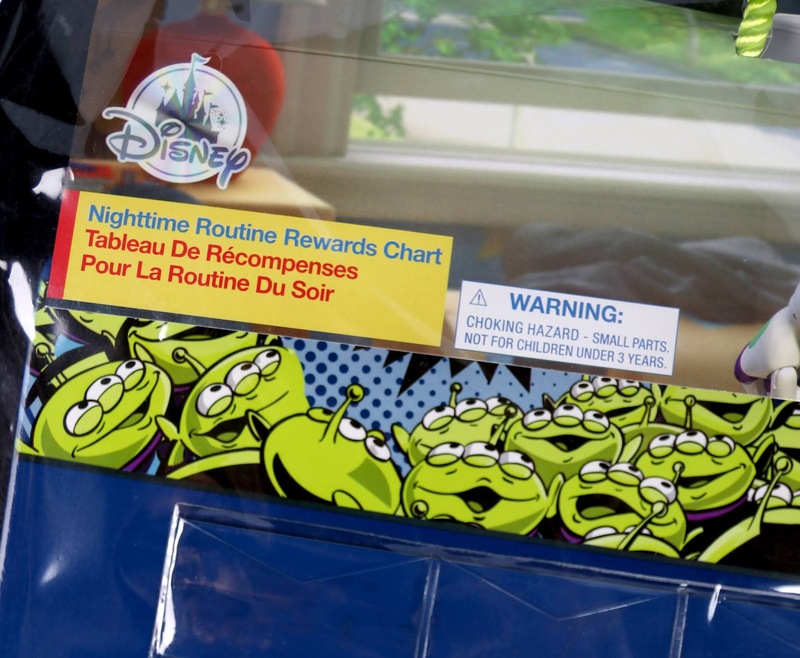 I've thought a nighttime rewards chart type tradition would be fun to do someday (it's something I never did as a little kid) and what better one to have than one that's Toy Story themed! I couldn't help myself. This chart is 19'' H x 14'' W and features seven spaces in a column on the left (for each day of the week) and six spaces in a row at the top (for each part of the nighttime routine). 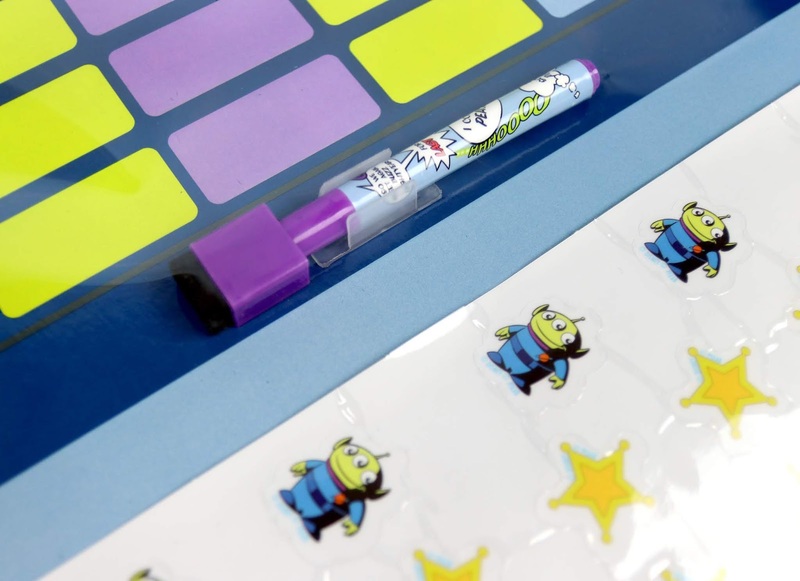 The nighttime routine labels fit in little clear plastic envelopes there at the top and you can arrange them in any order according to how you do things in your home. There's Woody's hat to represent getting dressed, a tub for taking a bath, a toy box of aliens for cleaning up toys, a toothbrush/paste for brushing teeth, books for reading a bedtime story and a pillow for going to sleep. There's even six blank labels you can customize with a marker if you'd like to add you own in. Everything about this is extremely cute; all the artwork is so well done and stylized to really captivate kids. 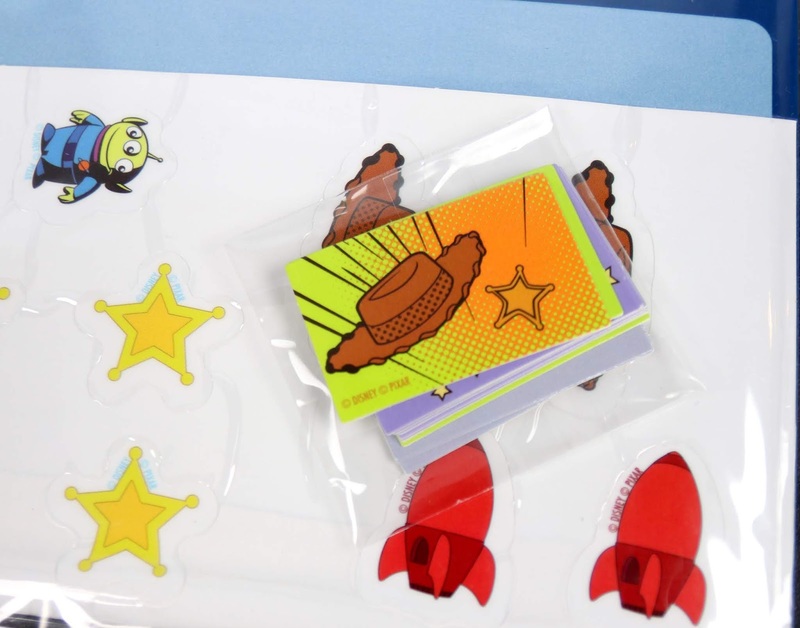 It comes with an erasable marker, a large rectangular space at the bottom for writing any notes and 42 resealable clear cling stickers featuring aliens, stars, hats, and rockets (seven of each design) to mark achievements. Recommended age is 3+; original retail price was $19.95. Unfortunately this item has sold out online, but there are a couple currently on eBay HERE if you're interested. While I understand that it's not good to completely rely on reward charts like this (you want kids to learn good habits/behavior, responsibility and helping others—not just for stickers or tangible prizes), I think there is a time and a place for this type of thing and I think it adds a little fun and magic to everyday "boring" routines. Once the whole chart fills up, it'll be fun to plan some kind of fun small reward/outing (say a trip to get ice cream or maybe a little toy they were wanting). Anyway, I think that about wraps up my thoughts! I'll be excited to see this in action one day and to see if a system like this works for our family/child. Did you pick one of these up? 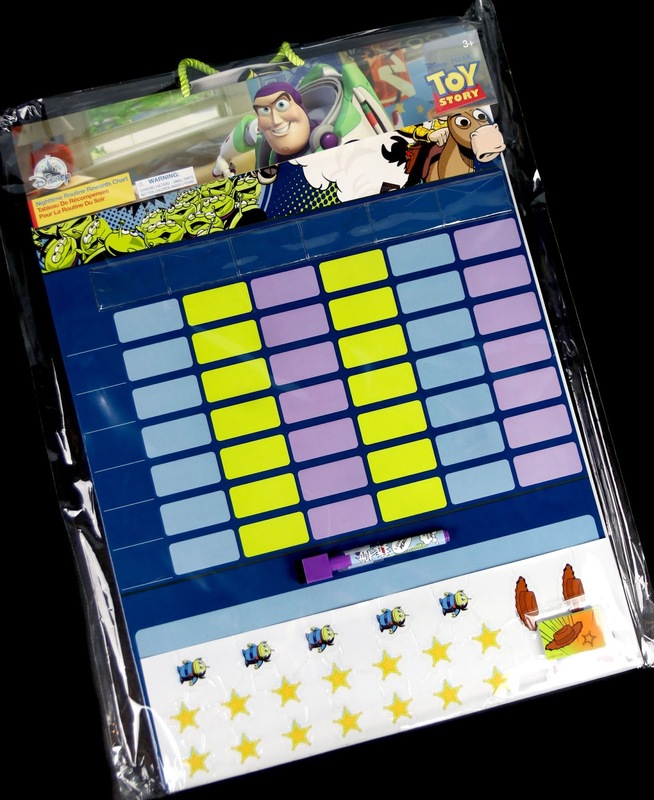 Has your family ever used rewards charts before and how'd it go? Let me know your thoughts down in the comments!